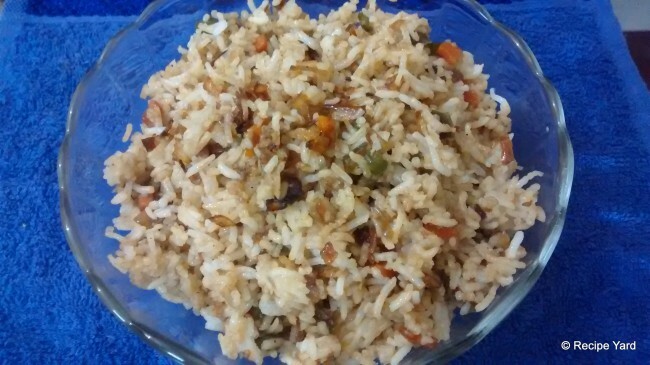 A much loved part of the Indo-Chinese cuisine, Vegetarian Fried Rice is a tangy rice dish cooked in the delicious combination of soya sauce, chili sauce and vinegar. Typically including finely chopped veggies, it can be easily tossed up at home. If you love Indo-Chinese, try it out today! Put a wok or deep frying pan over medium heat and put the oil in it. As soon as the oil heats up, add the chopped onions. Stir-fry them until they become translucent. Add the chopped carrot and stir. Reduce the heat and cover the wok or pan with a lid. Cook until the carrot becomes slightly tender. Add the chopped capsicum and stir. Cover the pan again and let everything cook until completely cooked but not mashy. Tip: Fried rice typically contains slightly crunchy veggies so don’t overcook them to the point where they get mashed up. Sprinkle salt and pepper and add the sauces and vinegar. Stir to mix everything. Finally add the boiled rice and toss to coat it evenly. Let the dish cook for a couple of minutes and then turn off the heat. Transfer to a serving dish and serve hot with choice of gravy.